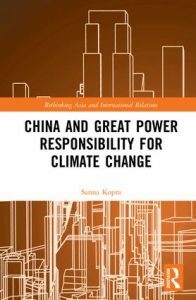 Read a new post on Aleksanteri Institute website about Sanna Kopra’s new book China and Great Power Responsibility for Climate Change, published this July. Based on the premise that great powers have unique responsibilities, this book explores how China’s rise to great power status transforms notions of great power responsibility in general and international climate politics in particular. The author looks empirically at the Chinese party-state’s conceptions of state responsibility, discusses the influence of those notions on China’s role in international climate politics, and considers both how China will act out its climate responsibility in the future and the broader implications of these actions. Alongside the argument that the international norm of climate responsibility is an emerging attribute of great power responsibility, Kopra develops a normative framework of great power responsibility to shed new light on the transformations China’s rise will yield and the kind of great power China will prove to be. The book presentation will take place on 7th of August at Tiedekulma at the panel discussion ”Suurvaltojen ilmastovastuullisuus”, where Sanna Kopra, Anna Kronlund (John Morton -centre, Turku university) and Veli-Pekka Tynkkynen will participate. The panel will be moderated by Emma Hakala (Finnish Institute of International Affairs). The event has free admission, but please fill in the registration form in advance. This entry was posted in 2018, ARKTIKO, Event, Media, Publication on 7.7.2018 by Elena Gorbacheva.